Facebook has evolved dramatically from its origin as a social platform that was just for college student. The platform now hosts users from every demographic, every continent on the planet (seriously, there’s a Facebook page for the South Pole research station), and a large number of businesses. To protect users from a deluge of spam from advertisers, Facebook has strict controls on the ways that business owners can communicate with regular users. This is certainly appreciated by most users, but there are times when people want to talk to a business and Facebook has recently made some to changes to make this easier. Facebook has added new options and features for customers wanting to communicate with Business Pages and for Business Page admins to respond. Last year, Facebook added Local Awareness Ads that business owners could use to target people within a given radius of a location. This made it easier for local stores to target content and ads to likely shoppers when they were in the area. These ads work, but many people who saw the ads had questions they wanted to ask before going to the location. 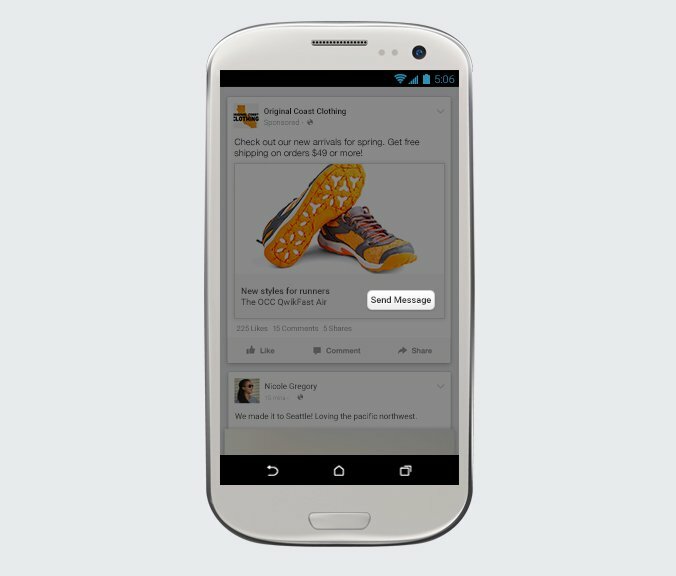 Facebook has made it easier to contact business pages in this situation by adding a “Send Message” button to Local Awareness Ads. When page admins receive the message, there will be an image of the ad that prompted the message so it’s clear what the customer is talking about. An even better feature that will soon be seen on business pages is the ability to reply to a comment with private message. In the past, Business Page admins could only reply to a message a user sent, they could never send one first. This meant that if someone asked a question in the comments that required a private reply, the page admin would need to ask the user to send a message first. Facebook is adding a “Message” button next to the “Reply” button on comments. Quick note: Though admins should use this “Message” button in situations where replying in comment would be inappropriate, it’s important to put a public reply that shows you responded to the comment. Customers look at things like comment when decided how responsive a company will be to their needs. If every comment that required actual assistance appears to be unanswered (since the admin replied with a private message) people may think the comment was ignored. One way around this is to send the private message and then leave a reply that says, “I sent you more information in a private message.” That way, it’s clear the business is being responsive to customers. These badges can become extremely valuable to business owners when customers are looking for a business that can quickly answer a question and provide a service. When deciding which pages they should spend time writing a message to, consumers will soon be looking for these badges as a sign they will get a response quickly. To put it simply, a page with a badge will get more leads from Facebook than a page without it. These recent changes make it easier than ever for business owners to communicate with customers through Facebook. And the badges make it more important than ever that businesses continuously monitor their Facebook pages. For more information about recent changes Facebook made to help marketers, read this article on how Facebook is changing the way they calculate cost per click to be more accurate.